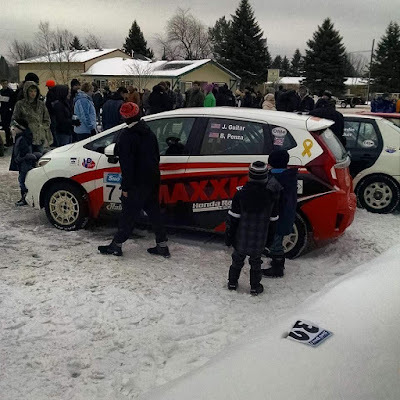 HPD and Maxxis again joined forces to showcase the 2015 B-Spec Honda Fit at the first round of the 2016 Rally America National Championship, Sno*Drift Rally. The Maxxis/HPD Rally Team had a very successful season in 2015, winning the B-Spec Championship and placing second in the 2WD Championship, showcasing the versatility and the reliability of the Fit-based platform. Striving to defend its B-spec title early at Sno*drift rally, the team would be tested again by a strong entry from Ford with their new turbo Fiesta-based platform. For the 2016 season, HPD/Maxxis has introduced a new driver, Jordan Guitar, Team Honda Research teammate, and fellow Honda Engineer to previous driver James Robinson. “I’m very excited to join the HPD/Maxxis team this year”, stated Jordan, “the Fit is a great platform and I am looking forward to some great competition in the B-Spec class”.